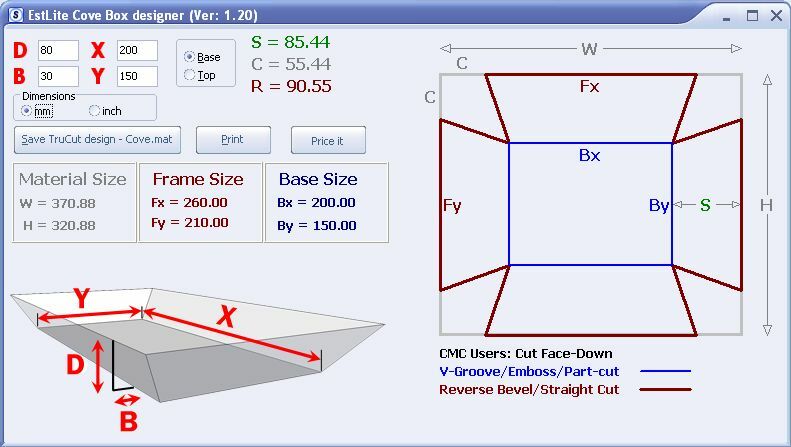 This is a Windows application to aid the design and construction of slope sided boxes made from mountboard (sometimes referred to as coved boxes, or slope sided shadow boxes). Using the results from the designer, it is a fairly simple job to cut out the shape. The trickiest part being the v-grooves (The blue rectangle in the diagram). The corner cut-outs can be made with straight-edge and Stanley knife. And of course, with a CMC the process is even easier. The program will run in any version of Windows from Win95 onwards. It requires only four inputs: the Depth and Breadth of the slope, and the dimensions of the base (shown in red in the diagram). Dimensions can be entered in inches or mm. To use, download and unzip the file, cove.exe, which can be placed in any suitable location on your computer, or on a memory stick. The application outputs your design to a PLT file that can be used by most CMCs, either directly, or via CorelDraw. Although this example has been cut on a CMC, it is not difficult to do it manually. V-groves on the base allow the sides to be easily folded up. Thank you for providing this handy utility for calculating cove mat dimensions. Very quick and easy to use! An incredible conicidence: Just a few days before I learned of this from a post on the USA Picture Framers Grumble, I submitted a feature article to Picture Framing Magazine. The subject was a project recently built in my shop; framing a folded flag and a certificate. I used two cove mats in it, and the article detailed how to use the CMC to cut the cove mats. May I ask the editor to include a link to your cove mat utility in the published article, if it's not too late? Interests: Picture framer; author of "THE COMPLETE GUIDE TO SHADOWBOXES AND FRAMING OBJECTS" and "MOUNTING OBJECTS WITH CLEAR FILM"; writer of feature articles for Picture Framing Magazine, USA; framing educator. Certainly, provide the link in your article. I hope that other framers will find the application useful. What a star! I use this little program a lot - and the improved version will make assembly just that little bit easier. Thank you John. Much improved and saves the mental math. I must credit Merlin with designing and rendering the beautifully clear graphical representation of the slope sided box (the lower left image in the screen shot). I have used previous versions of this for loads of boxes and find it an invaluable tool. Thanks, John. You have given us a very useful utility, and then improved it. Kudos to you. We've only used the cove box designer a few times, but it is so easy to use and saves tons of work - thanks John. Interests: Tudor history, swimming, walking and needlework. I also had a customer with a collection of medals in a little oak chest with drawers and we made some drawer liners also in suedette mountboard using the ciove box designer. Interests: Fly Fishing, Photography and Real Ale. Today is the first time that I've downloaded and tried the program. It's absolutely brilliant! All I need now is a customer to try it on! I bet you have something lying around or could pick up in a charity shop you could use for display in the shop. I ought to do the same! Yes, thanks from me too. Not a great picture but the medal is in a box. There's more to the picture, than meets the eye. Hey hey, my my. I would be interested to know about the different methods everyone uses to attach the cove box to the frame? Cut the sides as normal but leave more board, then score and fold a flap down then use tape or glue to attach to the reverse of the front board. Does this make sense?? it did to me! !